Kindergarten - you either love them or cringe at the sound of their class coming down the hallway. Fortunately for me the kindergarten classes at my new school have been fantastic so far! I think the big game changer for me was going from having 34-36 kindergarteners in my class at one time (with no para of course) to only 20-24. WHHHATTTTT?! I know, I know. AMAZINGGG. I can actually teach!! 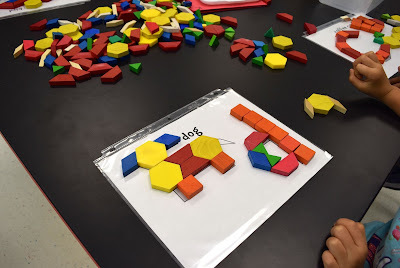 As I've mentioned in a previous post, I am at a brand new elementary school this year so I had to come up with some lessons that I could teach with minimal supplies. So this is what I came up with for kindergarten. I now see them for 2-3 days in a row. 20 days altogether by the end of the year. Intro to Mrs. Nguyen's art class. We go over the rules, I introduce them to class dojo, I let them wander around my classroom, and I tell them a couple things about myself. After I assign their seats (2 boys, 2 girls at each table) they get a piece of paper and are asked to write their name and draw a picture of themselves with their family. Afterwards I draw some lines on a sheet of paper being projected by my ladybug and ask students to try to identify them (I draw a straight, wavy, zig-zag, diagonal, spiral, and broken line). 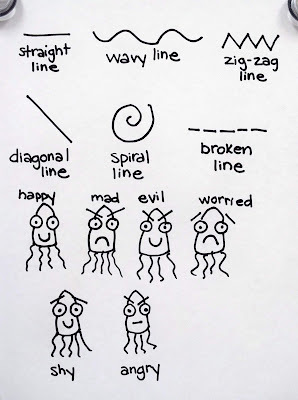 Then I have my kinders stand up and we all do some body movements that represent each line while saying its name (I'll post pictures or a video clip within the next couple days so you can see how cool I look! haha). Then I have my students go back to their seats and try to draw the lines we talked about on a sheet of paper. 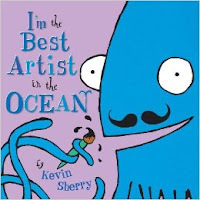 Once they are done drawing them I have them return to the carpet and we read "I'm the Best Artist in the Ocean" by Kevin Sherry. After reading it I flip through the pages and examine the illustrations with my students. 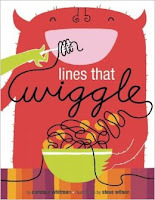 What lines do they see? We also talk about the expressions on the sea creature's faces. One of the squid drawings look very happy. How can you tell it is happy? What types of lines do you see? 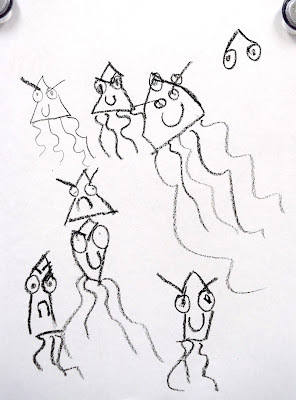 Then we talk about the angry looking fish. How can you tell they are angry? What types of lines do you see? I make sure to point out that it is the shape of the mouth and the shape of the eyes (or rather eye brows) that make up most of the facial expression. 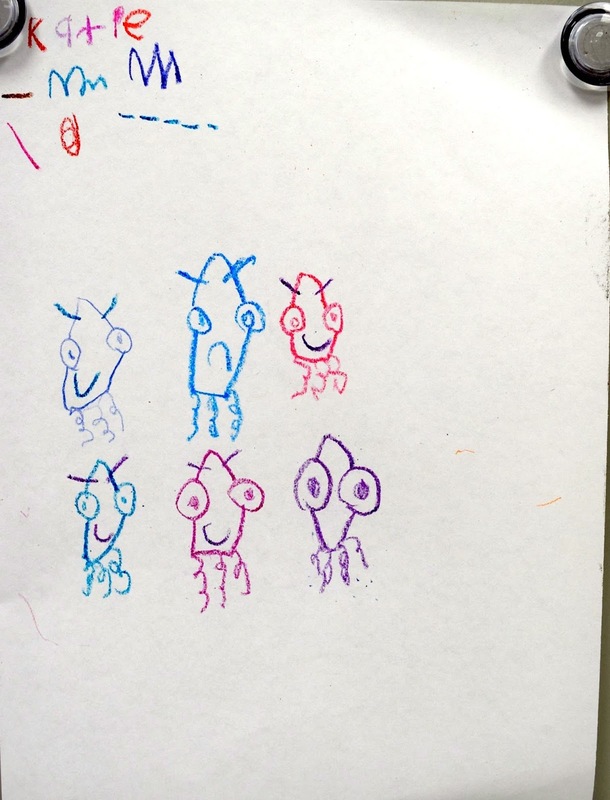 Then on a sheet of paper (once again under my ladybug) I draw some super simple squids and have students tell me what feelings their facial expressions show. We do different combinations of happy or sad mouths with eyebrows that are slanted diagonally up or down. 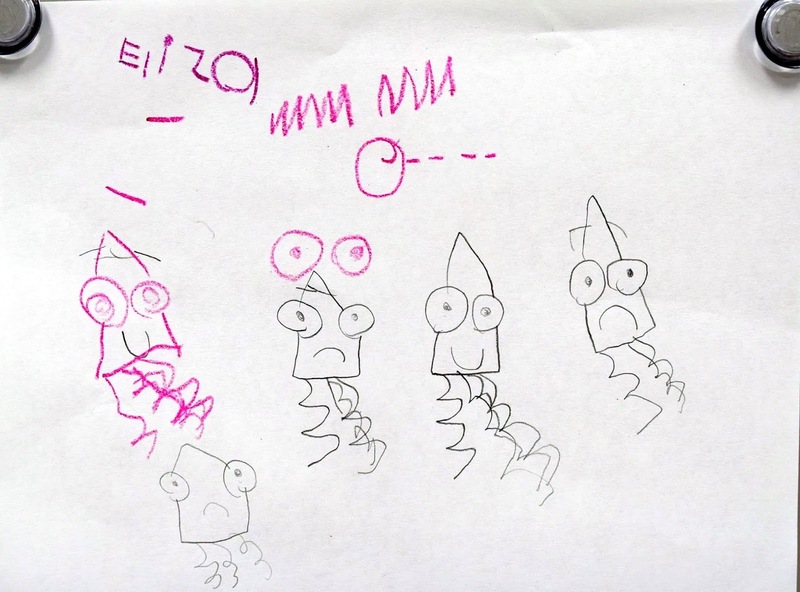 Students then go back to their tables and try to draw as many different expressions as they can! I get that 'evil' isn't really a feeling. But diabolical seemed like too big of a word. 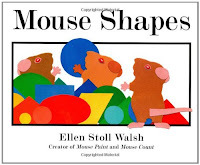 We begin by reading "Mouse Shapes" by Ellen Stoll Walsh and talk about all the shapes we see in the book. Then we quickly discuss the differences between a line and shape. A line has a beginning and an end while a shape is enclosed. Then we talk about how we can arrange shapes together to create larger images (basically an into to mosaics). I use a tub of math pattern blocks to demonstrate. 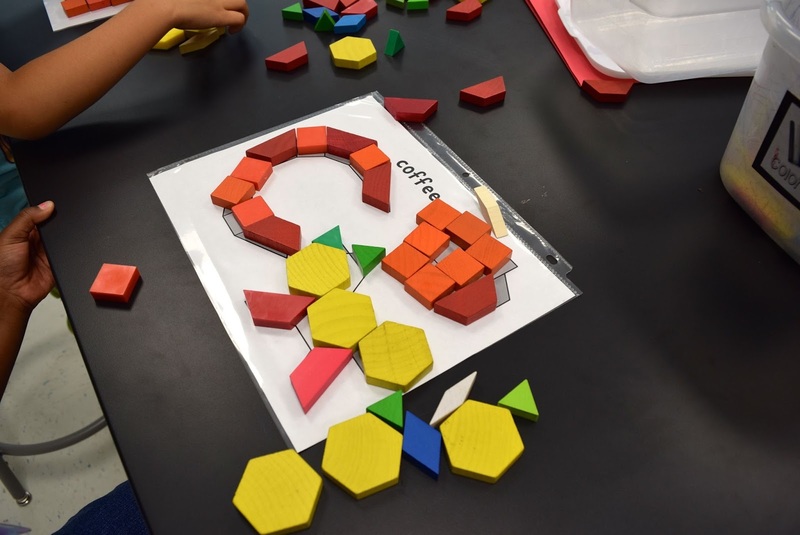 I also show students the various ways they can use different shapes to create a hexagon (2 trapezoids, 3 parallelograms (I just call them diamonds with them), or 6 triangles)! 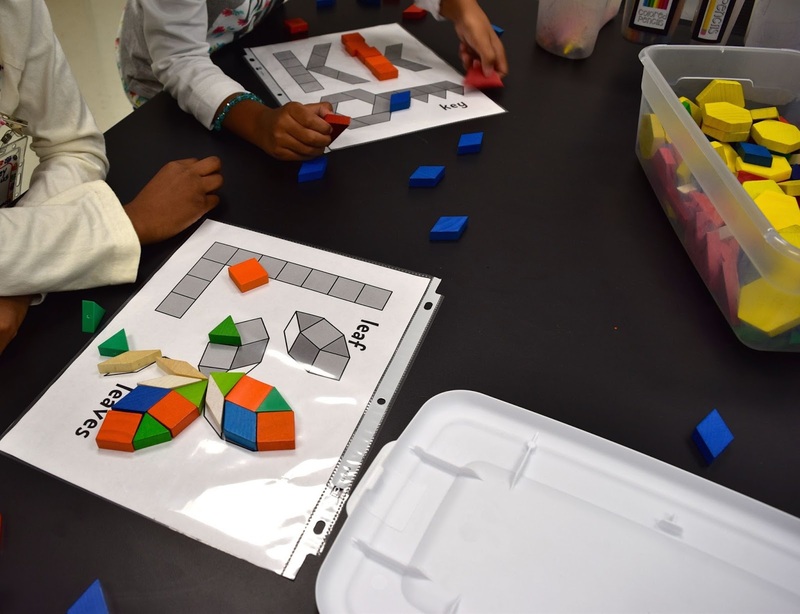 Then students go back to their tables with a bucket of pattern blocks and a printed pattern block puzzle sheet. I found these AMAZINGLY awesome printable pattern blocks sheets from 'Jessica's Corner of Cyberspace.' The kids love them and it challenges them to manipulate their blocks so that they fit correctly. They also have to work carefully to not bump their paper (or the blocks move). Once the kids finish their own sheet, they clear it and then switch papers with a partner. My AP came in during this lesson and was super impressed at how engaged my kinders were! Can't wait until I get more supplies in so we can really dig in and make some art! Hhahaha I know some truly "diabolical" kinders though. . .